This resonantly beautiful exhibition details the career of Thomas Spence, one of Australia’s premier artists working within the discipline of drawing. Three decades of his practice are showcased at Stanthorpe Regional Art Gallery and Redland Art Gallery simultaneously with works borrowed from public and private collections across Australia. 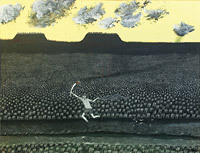 Image: Thomas Spence, The Olympic Torch comes to Muttaburra (detail) 1999, synthetic polymer paint, graphite, scraping out on paper. Private Collection Sydney. Courtesy of the artist.